USG Vice President Bobby Bertha passes by the Point Café as construction goes on during the first day of classes Monday. Students will not be able to eat in the Point Café until next week. Over the winter break, both of Point Park’s dining amenities, the Point Café and the Residential Dining Facility (RDF) underwent renovations as part of a project brought on by CulinArt and Point Park administration. The construction project that started Dec. 19 included minor changes to the RDF, as well as a complete renovation of the Point Café. 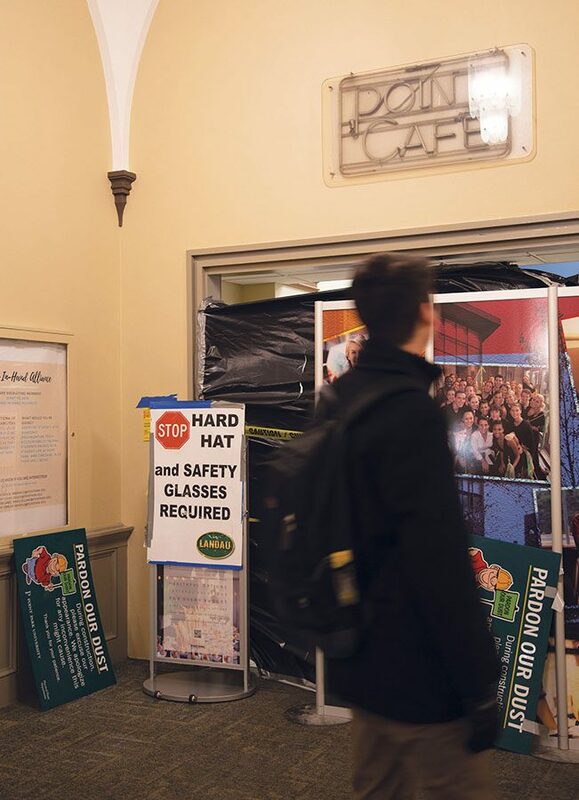 At the time of publication, the plans for the new Point Café were to remove the wall, reshuffle stations and add a new setup area for a convenience store option, according to Dean of Students Keith Paylo. In addition to space changes, the Point Café is also going to provide more offerings for students based on what has worked for students in the last semester. Vice President of the United Student Government (USG) and member of the food committee Bobby Bertha said the café will provide new opportunities for students. USG President Blaine King said that redoing the café has always been an idea that the university had. According to Paylo, The Point Café was due for an upgrade since the last major renovation happened nearly 14 years ago. However, the push for the renovation was a combination of both the new food service provider CulinArt and the aging of the café. Paylo said he believes the new Point Café will be welcomed because of the increase of students who regularly visit the café. USG Treasurer and member of the food committee Amedea Baldoni said with a new food service provider, changes come as well. “The renovations are a very good thing for the whole campus,” Baldoni said. Over the summer, the RDF was under construction before students came back to campus for the fall semester. Paylo said they finalized phase two of the project to remodel the RDF by adding the finishing touches which included a color change on the walls, installation of carpet and a shift in some of the stations. “You’re going to see those aesthetic changes more than anything,” Paylo said. One of the changes that happened in the dining hall was the addition of recyclable takeout containers that can be purchased for $5.00 using student flex dollars. Students will return the container each time and receive a new one. At the end of the semester, when students return their last to-go container, they will get their $5.00 deposit back. The RDF opened to students with the return of the semester, however, the café is currently closed because of the ongoing changes with a tentative opening for the second week of classes. Correction: An earlier version of this article incorrectly stated that the construction projects began Jan. 19 which was, in fact, after publication day. The Point Cafe and Dining Hall construction work began Dec. 19.